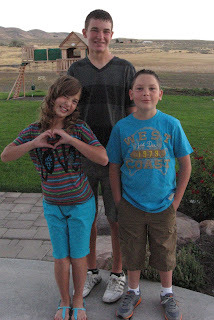 first day of school... 6:45 am Mason (14) 8th grade, Sadie (11) 6th grade, Nick (8) 3rd grade. "don't smile Nick, whatever you do!!!" Um... somebody was extremely excited for school today!!!!!! it was a lot of hair to curl but we had plenty of time.. she was up at 1 am, and then again at 6, dressed by 6:15! It's a miracle!! It may only be this one day, but it happened and I have pictures to prove it! (She's not such a morning person!) Had to be to the bus by 7:05 and had a 40 lb back pack to carry!!! Wow, we did it! Now... what to do, what to do... CLEAN!!!! !